Ward Cove is a bay located in Alexander Archipelago in southern Alaska, just a few miles outside British Columbia in Canada. The Ward Cove stream empties into the head of the cove, making it the outlet to many lakes found on Revillagigedo Island. Its rapid and relatively straight-coursed current made it an excellent location for a pulp mill back in the 1940s, when the paper industry was flourishing. It was used to process the timber from the Tongass National Forest into wood pulp. The industry’s decline, however, led to the definitive closing of the mill in 1997, which is now being converted into a boatyard for the Alaska Marine highway. Ward Cove is the name of a settlement in the unincorporated community of Ketchikan Gateway Borough. The area is not for the urbanites and the bustle aficionados; at just 57 inhabitants, Ward Cove should be thought of more like a retreat, an ode to nature. It is a fisher’s paradise! A number of tour operators based in Ketchikan will be happy to take visitors on an exploratory journey on the Alaskan waters. 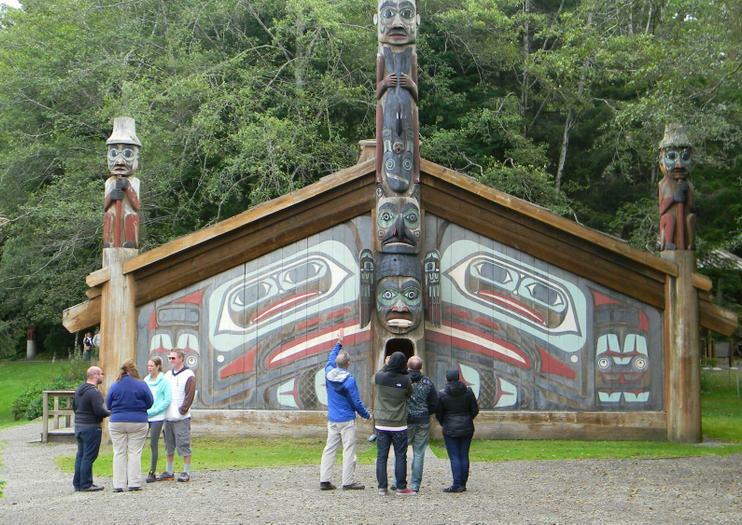 Another local attraction is the Totem Bight State Historical Park, located just north of Ward Cove. A National Register of Historic Places, it showcases a collection of 15 delicate totem poles and a recreation of what would have been a typical clanhouse at the time of settling, in the early 1900s. Ward Cove is located 15 minutes north of Ketchikan (7 miles/11 kilometers) and can be reached via North Tongass Highway. There are ferry services from Juneau, Hollis and Wrangell to Ketchikan, as well as an international airport on neighboring Gravina Island. In reality, most amenities, services and shops are located in Ketchikan. Services found in Ward Cove consist of a post office, a gas station and a coffee shop.